Kale Ane wants to stop Micah Mamiya. Delbert Tengan intends to bother Brett Kan. The problem is, coaches can't do a single thing to shut down the quarterbacks of the state's top two teams. It will be up to their players. When Saint Louis outlasted Punahou in a wild 38-35 shootout two weeks ago, fans got their money's worth, players spent every ounce of energy and coaches grew a few more gray hairs. Saint Louis quarterback Micah Mamiya, top, and Punahou quarterback Brett Kan, below, battled in a 38-35 shootout this season. "Like Yogi Berra once said, 'It's deja vu all over again,' " said Tengan, who last guided Saint Louis to the Interscholastic League of Honolulu title in 2003. Already 3-0 in league play (6-0 overall), the Crusaders can take command of the race with a victory over the defending ILH champs. The prospect of a rematch -- kickoff is set for 7:30 p.m. tomorrow -- has heavyweight implications. No. 2 Punahou (5-1, 2-1 ILH), ranked first through the first month of the season, cannot afford another loss to No. 1 Saint Louis. Conversely, a loss by the Crusaders opens up possibilities for third-place Kamehameha, which has two league losses. For Punahou, which averages 362 yards per game in ILH play, offense is not an issue. Yes, Saint Louis steamrolled its way to a 31-0 halftime lead in the first meeting. However, Punahou racked up five touchdowns in 24 minutes against what may be the best defensive unit in the state. Saint Louis' offense perked up with Mamiya's mastery of the flex option. He ran for 113 yards and three touchdowns against the Buffanblu. His deft fakes left Punahou's defense, which had been outstanding through four games against top-notch teams, grasping for air. It seems simple enough: Stop Mamiya, and you stop the Saint Louis offense. "It's like that ESPN saying, 'You can't stop him. You can only hope to contain him'," Ane said. Mamiya didn't just hurt Punahou on the ground. He connected on eight of his 13 passes for 127 yards. 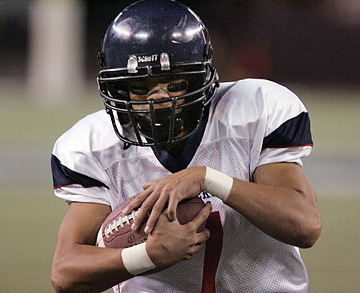 Kuli'a Aiona averaged nearly 29 yards per catch that night. Ane will have to pick his poison, so to speak, which means slowing Mamiya. "We're trying to simplify it, step up and slide out. Any time you play an option team, you need to have your roles solidified," he said. Tengan and his veteran staff are anticipating new wrinkles by Punahou. "I'm sure they'll pay a lot more attention to Micah," Tengan said. "They've been successful with this defense. It took them to the ILH championship and the state finals last year." Punahou's young defense learned a valuable lesson, Ane hopes. "People tended to do too much," he said. It'll come down to basic, assignment football for the Buffanblu defense. Easier said than done. Damien (2-3-1, 1-1-1) at Iolani (3-2-1, 1-1-1) -- The battle for first place in the Division II race kicks off in mid-afternoon, which can often be a plus for the Raiders. Few teams are used to the humidity and heat that blanket the area, just a stone's throw from Waikiki. Going back to last season's league finale, the two squads have been in epic battles. Iolani won the D-II title with a 57-49 thriller over the Monarchs. When they met last month, the teams fought to a 34-all tie. League-leading rusher Kama Bailey had a state-high 301 yards against Iolani and 188 yards in two other ILH games. Iolani quarterback Ryan Dung passed for 254 yards and two touchdowns, and Justin Yamamoto ran for 132 yards. Both Raiders rank second in the league in those yardage categories. Pac-Five (2-4, 0-3) vs. No. 4 Kamehameha (5-2, 1-2), Aloha Stadium -- The Warriors are coming off a 31-15 win over Damien, a team that downed Pac-Five soundly. The last time they met Pac-Five, they won 27-7. The Wolfpack have not enjoyed victory since a nonconference 28-20 win over Kalaheo five weeks ago, and Kamehameha's defense ranks first in the league (178 yards allowed per game). Waipahu (4-2-1, 4-1-1) vs. Anuenue (1-7, 1-6), Kailua High School field -- The season finale for Anuenue would be a good time to gain momentum for next season. Na Koa, a squad comprised mostly of underclassmen, could spoil the Marauders' quest for a top seeding. Waipahu, however, has thrived on the ground with few exceptions. Last week's 7-all tie at Nanakuli was a rarity, and all of Waipahu's runners were held to less than 90 yards for only the second time this season. Nanakuli (2-4-1, 2-3-1) vs. Kaimuki (4-2-1, 3-2-1), Roosevelt High School field -- The Bulldogs need a win to stay in the tight playoff race, but it will not be easy against an improving Nanakuli squad. First-year coach Tai Apisa's defense stymied Waipahu's running game last week and could do the same to Kaimuki. Pearl City (5-1-1, 4-1-1) at Waialua (5-2, 4-2) -- For the first time ever, the Chargers and Bulldogs will engage in a late-season contest with playoff implications. Antoin DeWalt continued his rampage on the ground with 120 yards (12 per carry) and two touchdowns in a win over Anuenue last week. Micah Dela Cruz (118 yards) gives Pearl City a nice 1-2 combo in the backfield. Waialua, seeking one of four playoff berths, can't really afford another loss. Last week's gut-check 24-21 win over Kaimuki was a boost for the Bulldogs defense, which limited Kaimuki to well under 100 rushing yards. Bulldog quarterback Caleb Fore passed for just 100 yards, but committed only one turnover in a winning effort. He leads the conference in passing with 1,208 yards and 16 touchdowns. Honokaa (4-3, 4-2) at Keaau (4-3, 4-2) -- Toss out the fact that Honokaa is a D-II team and this is a very intriguing matchup between two rebuilding programs. Keaau won last year's matchup, 7-0. The Dragons, however, are improved this season. If not for a forfeit, they would lead the D-II race outright. Konawaena (4-3, 4-2) at Hawaii Prep (2-5, 2-4) -- The pristine slopes of the Kohala Mountains are a historic backdrop for this longtime series. Kona quarterback Kawai Kanuha's passing skills could be the difference. HPA, however, has Jung Park, an ace place-kicker who has neutralized teams like Hilo and Kohala. Pac-Three (0-6, 0-1) at Lahainaluna (5-1, 1-0) (homecoming) -- The concept of home games for Luna fans was more of a pipe dream for more than two decades. Now, Lahainaluna draws well over 2,000 fans -- some of the most enthusiastic supporters in the state. The Titans can't be taken for granted, though. Andrew Pacheco is the third-leading rusher in the MIL with 477 yards. Maui (1-5, 0-1) at King Kekaulike (4-2, 1-0) (homecoming) -- For this year, at least, King Kekaulike is in the driver's seat to clinch the league's only Division II state berth. Shannon Kamakaolani ran for three touchdowns and returned a kickoff 88 yards for another score in King K's 40-20 win over the Sabers six weeks ago. He is second among MIL rushers (593 yards). Maui has struggled, but still can boast having the league's top rusher in Jonathan Los Baños (677 yards).